The PlayStation Portable version of Pinball Heroes was delisted no later than July of 2013 when Pinball Heroes: Complete was released on PlayStation Vita. 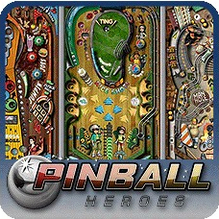 The original Pinball Heroes served as a platform with the initial four tables available at $3.99 each. On May 25th, 2010 an additional four tables were released (ModNation Racers, Fat Princess, WipEout HD Fury, MotorStorm). This piecemeal version of Pinball Heroes was only available in North America. Pinball Heroes: Complete, which includes all of the tables, multiplayer, touch controls, and Trophies, remains available in Australia, Europe, and Korea as of June 2018.